What you focus on will bring you victory or defeat. Learn to look beyond your circumstances and wait expectantly until you receive the manifestation of your faith. 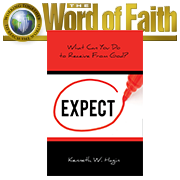 • Expect, a book by Kenneth W. Hagin. The key to receiving from God is looking at our circumstances the right way. What we focus on will bring us either victory or defeat. Rev. Hagin explains how we can stand in expectant faith until we receive what we’re praying for.